Please read this thoroughly before coming to stay with us. 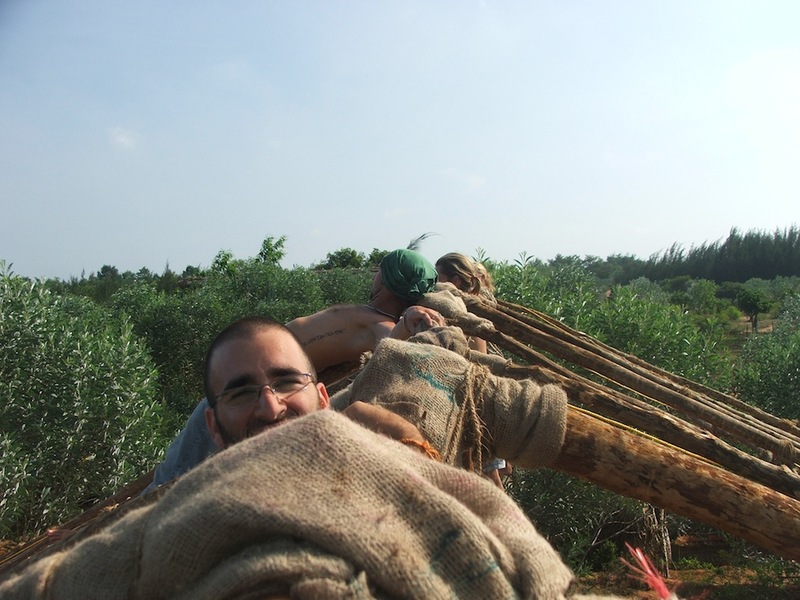 Sadhana Forest is community of individuals from all over the world. People of all ages and abilities are welcome to come to stay and get involved with us. Our experience with guests, from all over the world, has been very positive. They have created here a vibrant community atmosphere. Living and participating together, and sharing our experiences brings us into harmony with nature and ourselves. One of our community members put it very nicely in her letter to us when she left: “May there be many more forests to grow people”. We are happy to welcome guests here any time of the year and always have plenty of space for them!!! We are fully committed to accept everyone that wishes to stay here and help recreate the forest. You do not need to let us know the date of your arrival unless you wish to do so. Community members should not smoke cigarettes, use drugs, or drink alcohol, inside or outside of Sadhana Forest, during their entire stay. Only come to Sadhana Forest if you are 100% sure that you are able and willing to completely respect this. This guideline helps us stay always fully aware of our behavior, and maintains our personal health, safety and security. We welcome new guests on weekdays between 5:30AM and 6:00PM. There is no need to make any sort of reservation. Guests arriving before noon may choose either to join a seva team immediately or to rest and admire our beautiful living space until lunch. We serve lunch at 12:30PM and can give a full welcoming, including tour and registration, between 2PM and 6PM. Guests may also arrive on weekends between 9:00AM and 5:00PM. Please be aware, though, that the community is likely to be very quiet: there is no forest seva on the weekends, nor is there any lunch served inside Sadhana Forest. We highly recommend arriving during daylight hours. If you will be arriving earlier or later, please inform us in advance. Please be aware that we ask that each of our guests commit to a minimum amount of time with us. This is meant to ensure the smooth functioning of the community and the best experience for all involved. For citizens of foreign countries aged 40 and above and for families with one child or more the minimum stay is two nights. For citizens of foreign countries under the age of 40, the minimum stay is 4 weeks from December 1st to March 31st. For those arriving from April 1st to November 30th, the minimum stay is 2 weeks. For citizens or residents of India the minimum stay is 2 nights. Many choose to stay for a few months or more. We are very interested in long term participants/interns staying with us for a period of six months or longer. Please email us for details about committing to a longer stay. We appreciate creativity and initiative, and welcome any ideas you may have to improve our project and our community. If you are reading this and you are a resident of India, a family, or person above the age of 40 please email to tell us this and we will reply with the appropriate information email. 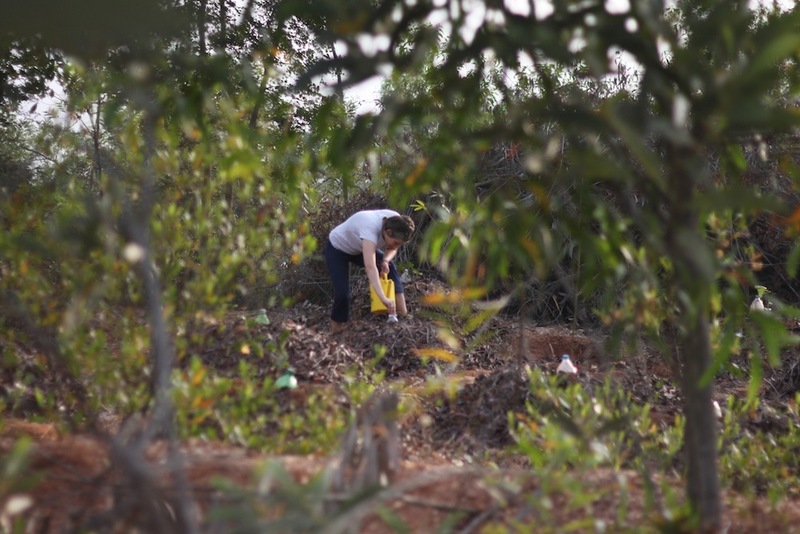 Our main project is the reforestation of 70 acres of severely eroded land. We are working to recreate the Tropical Dry Evergreen Forest which is indigenous to our area. This forest type is found only in Southern India and Sri Lanka and provides a rare biological richness due to its very high species abundance (over 1000 species of trees, shrubbery and liana). The Tropical Dry Evergreen Forest is now close to total extinction as only 0.01% survives. This is a last moment effort to keep this very rich and beautiful Forest on earth. As part of our reforestation effort we are also working on water conservation and soil management. No skills are required for this effort, just a willingness to help the forest. For more information about our work please go to: Sadhana Forest India. For information about our project in south-east Haiti please see: Sadhana Forest Haiti. For more information about our project in northern Kenya please see: Sadhana Forest Kenya. We practice an eco-friendly way of life including: veganism, alternative construction, solar energy, biodegradable toiletries, recycling, food composting, riding bicycles, compost toilets, and purchasing local, organic foods whenever possible. We do not charge for accommodations for guests. We engage in seva (selfless service) for an average of 25-35 hours per week which includes additional community shifts such as cooking meals, cleaning after meals, maintaining solar panels. etc. Participants mainly plant, mulch, and water trees during the planting season, work on water conservation in the forest and around the community, maintain the community area, and spend time with the community children. Free facilities include a small swimming pool, free 24/7 unlimited access to the Internet with your own laptop – weather and technical issues permitting, five hours each day (excluding Fridays) of AC power to charge electrical items (sun permitting), a small library, the use of several bicycles, and a playground for children. There are also daily workshops offered that are run by our community members and guests and vary each week. At Sadhana Forest we eat a pure vegan diet, which means no animal products from living or deceased animals. We eat fruits, vegetables, rice, millets, beans, and dal. 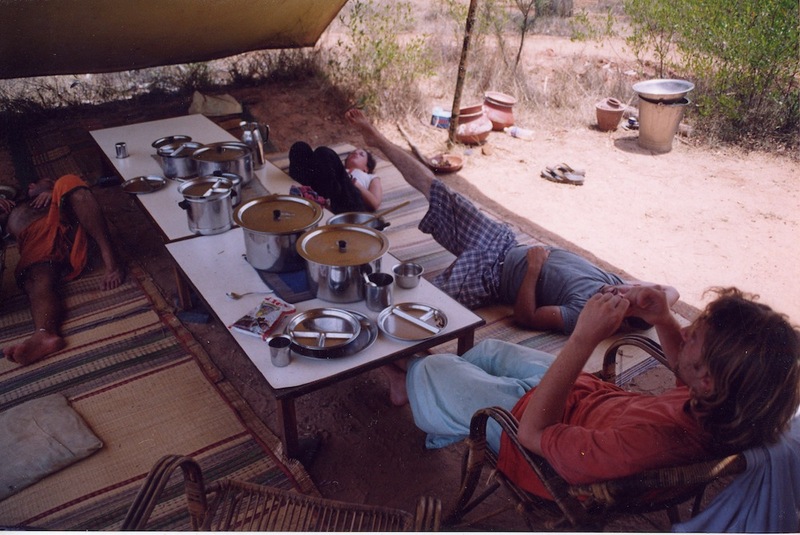 Sadhana Forest is a non-profit ecological project that does not generate any income; therefore we unfortunately cannot afford to provide free food for guests. We share the cost of our 100% vegan meals equally. The total cost of food per person is 500 INR per day (just under 8 USD per day). This price is subject to change based on the economy of India. Please contact us soon before your arrival to make sure you have the correct, current information. 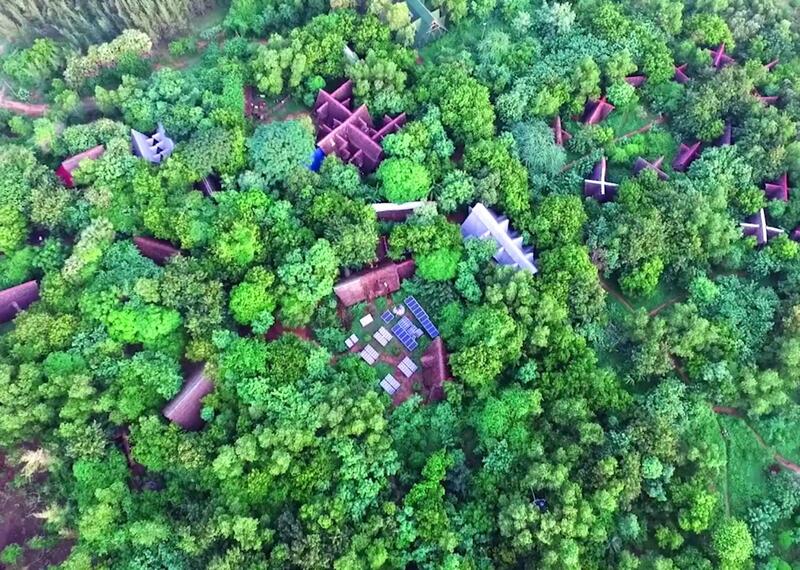 Sadhana Forest is part of the international community of Auroville, 6km north of Pondicherry, in Tamil Nadu, South East India. We look forward to welcoming you to Sadhana Forest soon! THANK YOU AHIMSA ECO SOLUTIONS AND EKA BHUMI YOGA FOR YOUR GENEROUS SUPPORT! Today is the big day! 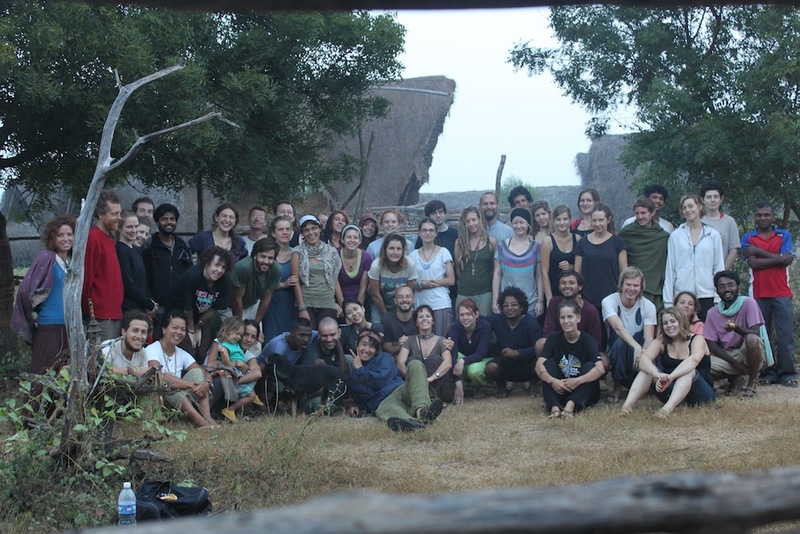 15 years ago Sadhana Forest was created and from then on thousands and thousands of wonderful people have grown this work!